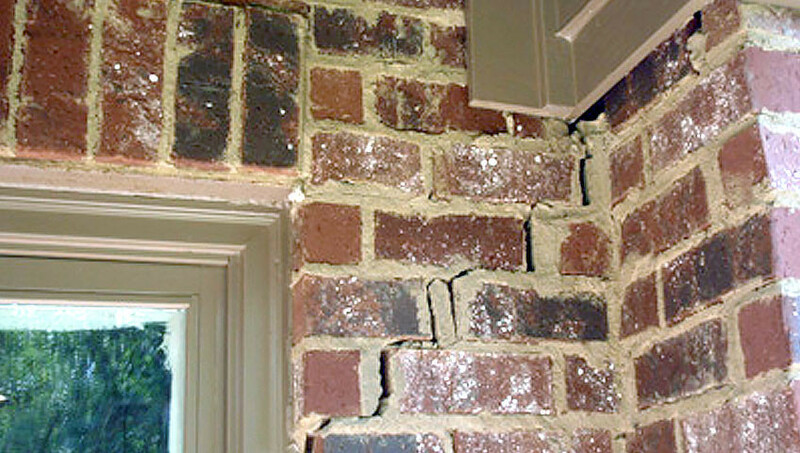 When foundations settle, cracks in brick veneer can result. If you're told that these cracks represent foundation failure, it's not necessarily the truth. Brick veneer is a very brittle material that cannot take much stress without cracking. Brick veneer is simply a protective exterior siding (weather barrier) and does not provide any structural benefit to the home. Underpinning the foundation because of cracks in brick veneer can be a waste of money. Clay-fired brick are baked in a kiln (large oven) to thousands of degrees Fahrenheit and when the brick leave the oven they have absolute zero moisture content. The brick then spend the rest of their life taking on moisture which causes a dimension increase or expansion. In commercial buildings, architects employ the use of expansion joints alongside windows and doors and at periodic distances in long walls to accommodate this long term growth. In residential construction, this is never done because it is considered unsightly. Whenever you have long walls of brick veneer with multiple windows within the wall, the continuous panel of brick below the windows experiences more growth (expansion) than the upper intermittent panels of brick broken up by the windows. This differential expansion can lead to stair-step cracking below the windows. Many foundation repair contractors (and some engineers!!) will tell you that these cracks represent foundation failure and recommend foundation underpinning as a method of repair. This is completely untrue. When the foundation settles differentially (unevenly) brick veneer can develop cracks. It takes very little differential settlement to cause brick veneer cracks. However, the wood frame building structure behind the brick veneer (most of the time) doesn’t care. If you don’t have cracks in drywall opposite the brick veneer cracks, then there is probably no problem or concern. Wood frame structures are extremely flexible and can endure much strain without excessive stress. The only way to determine when differential settlement is a problem is to perform a floor level survey. If the survey reveals fairly level floor conditions, then the brick veneer cracks are moot and nothing to worry about. The cracks can be left alone, caulked or repointed. The later requires a conscious effort on the part of the brick mason to match the mortar color; otherwise, the repair can look much worse than the bare cracks. There are a host of other causes of brick veneer cracking including steel lintel expansion, steel lintel rust-jacking, shrinkage of cement-based brick, expansion of clay brick resisted by shrinkage of concrete or concrete masonry, shrink-swell of underlying expansive clay soils, and compression of brick veneer by shrinkage of the wood frame building structure.